← RIP Crooked Tongues forum? Hi David, so who designed the Classic Leather, and where? It was designed by Paul Brown (head of design) but the idea was Brian Igoe’s (Product manager for running), it was designed while we where in Korea. Can you remember how the Classic Leather (CL) was born? There had been great success with Freestyle, Freestyle Hi, Ex-o-Fit (Mens’ Freestyle), Workout and Princess, all of which were in the fitness category (Ed Lussier was the product manager). We then created the Phase I leather tennis shoe and Brian wanted some of the great sales that we had in these shoes to transfer into running which was lagging behind. Did it evolve from a specific shoe, existing last or midsole? We already had a shoe called CLASSIC, it had run in several colours of nylon and suede, a leather version made sense, as it fit with the Reebok story of soft leather and would take sales from Nikes Cortez leather shoe which had been around for years. shoes to transfer into Running which was lagging behind. The Classic Leather name is obviously connected with the Reebok Classic – can you tell me anything about the relationship of these 2 shoes? The only clear similarities are the name and the ‘Roadstar’ outsole. Yes, you are right. The Classic shoe had been around for a few years. It was a mid-range, mid-price shoe and needed updating, the style pictured above had been around since the late seventies and the square cut heeled ‘road-star’ sole was very dated by ’83, so a direct replacement was created and a fashion leather version too. Can you remember the original CL colourways, David? 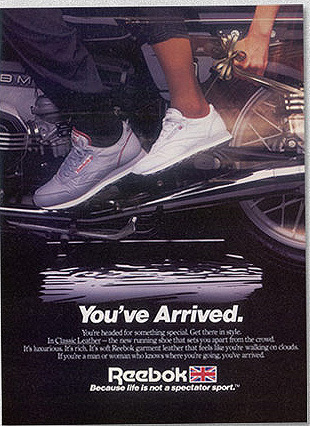 An early advert from 1983 shows a Grey for Men (with red piping/details) and White for Women? White/Light Grey was available in both genders as was a solid Black option. Grey/Burgundy did not last that long! Well, there’s a colourway that Reebok Classics should consider retroing! So what was the Classic Leathers original purpose — was it a runner at all, or purely casual? I suppose that looking back it was a cynical attempt to put ‘garment leather’ leather into a running shoe, but the ’80’s was a time of great change in fashion, driven by those early Reeboks and Adidas football trainers like Samba, so it caught on fast. Reebok distribution outside the USA was very Running biased, so Classic Leather was a much more acceptable shoe for the retailer to accept than a ladies fitness shoe! Those retailers just didn’t exist at that time. full soft grain leather, for the time very expensive. Can you elaborate on the story about Reeboks mistakenly made in Soft Garment Leather? [It] went back a little further [than the Classic Leather] — when we first launched Freestyle, there was a suede leather shoe called Energizer launched with it. The first orders we got were for 30,000 Energizers and 60,000 Freestyle. We in the product/production department based in Korea thought that was a bit odd — Energizer was similar to a New Balance shoe, which was the first aerobic shoe, so surely that was the 60,000 pairs. We checked again with sales, who confirmed 60,000 Freestyles. We ordered the materials and started product when we got an urgent message saying that the names had been mixed by a large retailer and we should make the quantities the other way around. At that time it could have killed the company, we could not return the materials as it was all special order so had to take the shoes. We slowed everything right down and went on a sales drive. Luckily for us the Freestyle took off like crazy and the shoes flew out of stores! Reebok had made it — we never looked back. It could have been so different! Did the CL prove popular in the UK or the US at the time? The Classic Leather was the first truly international success for Reebok — while aerobics was massive in the USA, it took a long time to catch on overseas. Reebok was traditionally a Running company, and to our customers [and the] running stores the Classic Leather was much more acceptable to them. Do you have any thoughts about the negative pub lad/geezer image it somehow picked up in the UK, 80’s/90’s? No, it is the flip side of success. In the early 80’s it was a really cool shoe worn by pop stars and other celebs. As that filtered down and became widely available it was taken up by a wider selection of people until it became the wear of shell suited Chavs, typified by Harry Enfields ‘Loadsamoney‘ then ‘Wayne and Waynetta Slob‘. As companies search for sales and drive prices down, they end up in discounters and end up on the feet of the many! If you want to be exclusive don’t sell to the big sheds, [that] would be my answer. The Classic Leather was the first truly international success for Reebok. Is there anything else you can tell me about the original? The first shoe was a fantastic piece of kit — full soft grain leather, for the time very expensive at £40 in 1983 [which] is close to £150 now. (Some) current shoes are a plastic parody of the original, big shame in my opinion, but ‘that’ as they say ‘is life’. (Retrobok note: Davids opinion is his own, and he was not referring to the 2011 Vintage Release shown). The opinions expressed in this article are not necessarily the opinions of Retrobok. Images throughout of the Classic Leather are of the 2011 Vintage release. You can read Retroboks’ previous interview with David here. Posted on September 20, 2013, in Features, Interviews, Newsfeed and tagged Classic Leather, david foster, Reebok Classic, Retrobok. Bookmark the permalink. 1 Comment. Great interview…. love the reebok site. wish I could find more size 15 wide… I still have one last clean pair I bought before zappos and others stopped carried those sizes.